For other uses, see Avarice (disambiguation). Avaris (/ˈævərɪs/; Egyptian: ḥw.t wꜥr.t, sometimes transcribed Hut-waret in works for a popular audience, Greek: Αὔαρις, Auaris) was the capital of Egypt under the Hyksos. It was located at modern Tell el-Dab'a in the northeastern region of the Nile Delta, at the juncture of the 8th, 14th, 19th and 20th Nomes. 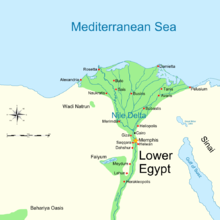 As the main course of the Nile migrated eastward, its position at the hub of Egypt's delta emporia made it a major administrative capital of the Hyksos and other traders. It was occupied from about 1783 to 1550 BC, or from the Thirteenth Dynasty of Egypt through the Second Intermediate Period of Egypt until its destruction by Ahmose I, the first Pharaoh of the Eighteenth dynasty. The name in the Egyptian language of the 2nd millennium BC was probably pronounced *Ḥaʔat-Wūrat 'Great House' and denotes the capital of an administrative division of the land. 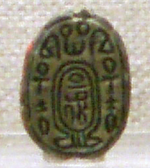 Today, the name Hawara survives, referring to the site at the entrance to Faiyum. Alternatively, Clement of Alexandria referred to the name of this city as "Athyria". In 1885, the Swiss Édouard Naville started the first excavations in the area around Tell-el-Daba. Between 1941 and 1942, Labib Habachi, an Egyptian Egyptologist first forwarded the idea that the site could be identified with Avaris. Between 1966 and 1969 and since 1975, the site has been excavated by the Austrian Archaeological Institute. Using radar imaging technology, its scientists could identify in 2010 the outline of the city including streets, houses, a port, and a side arm of the River Nile passing through the city. The site at Tell el-Dab'a, covering an area of about 2 square kilometers, is in ruins today, but excavations have shown that, at one point, it was a well-developed center of trade with a busy harbour catering to over 300 ships during a trading season. Artifacts excavated at a temple erected in the Hyksos period have produced goods from all over the Aegean world. The temple even has Minoan-like wall paintings that are similar to those found on Crete at the Palace of Knossos. A large mudbrick tomb has also been excavated to the west of the temple, where grave-goods, such as copper swords, have been found. Towards the end of the Seventeenth dynasty, Kamose, the last king of the Seventeenth Dynasty, besieged Avaris, but could not dislodge the Hyksos, who were finally expelled some 18 years later (c. 1550 BC) by Ahmose I, the founder of the Eighteenth Dynasty. The Eighteenth Dynasty-based themselves in Thebes and Avaris was largely abandoned, its former citadel becoming the site first of enormous storage facilities, including numerous silos and then a military camp, until finally a new palatial compound of the 18th Dynasty was constructed on top of the camps and soldier graves. Avaris was absorbed into the new city of Pi-Ramesses constructed by Ramesses II (1279–1213 BC) of the Nineteenth dynasty when he moved the capital back to the Delta. 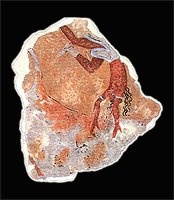 Fragment of a Minoan fresco found in Avaris, Egypt. This fresco is very similar to another fresco from Knossos, Crete. Avaris, along with Tel Kabri in Israel and Alalakh in Syria, also has a record of Minoan civilization, which is otherwise quite rare in the Levant. Manfred Bietak, an Austrian archaeologist and the excavator of Tell Dab'a, has speculated that there was close contact with the rulers of Avaris, and that the large building representing the frescoes allowed the Minoans to have a ritual life in Egypt. French archaeologist Yves Duhoux proposed the existence of a Minoan 'colony' on an island in the Nile delta. ^ Holladay, John S. Jr. (1997) "The Eastern Nile Delta During the Hyksos and Pre-Hyksos Periods: Toward a Systemic/Socioeconomic Understanding", in Eliezer D. Oren (1997). The Hyksos: new historical and archaeological perspectives. University Museum, University of Pennsylvania. pp. 183–252. ISBN 978-0-924171-46-8. ^ Baines and Malek "Atlas of Ancient Egypt" p 15 nome list and map, p 167 enlarged map of the delta. ^ Michael Grant (2005). The rise of the Greeks. Barnes & Noble Books. ISBN 978-0-7607-7000-9. ^ a b "Tell el-Dab'a - History". Tell el-Dab'a-Homepage. Archived from the original on 26 June 2010. Retrieved 2010-06-21. ^ "Ancient Egyptian city located in Nile Delta by radar". BBC News. 2010-06-21. ^ Booth, C. (2005). 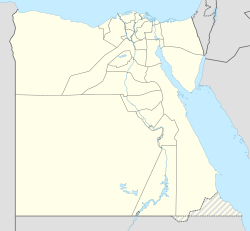 The Hyksos Period in Egypt. Shire. p. 40. ISBN 9780747806387. Retrieved 2016-02-03. ^ Duhoux, Yves (2003). Des minoens en Egypte? "Keftiou" et "les îles au milieu du Grand vert". Liège: Univ. Press. ISBN 90-429-1261-8. Carl Nicholas Reeves (2000). Ancient Egypt: the great discoveries : a year-by-year chronicle. Thames & Hudson. ISBN 978-0-500-05105-4. Pierce, R.W., Entry on "Rameses" in Geoffrey W. Bromiley (June 1995). The International Standard Bible Encyclopedia: Q-Z. IV. Wm. B. Eerdmans Publishing. ISBN 978-0-8028-3784-4. Retrieved 2010-11-27. Manfred Bietak (1996). Avaris, the capital of the Hyksos: recent excavations at Tell el-Dabʻa. British Museum Press for the Trustees of the British Museum. ISBN 978-0-7141-0968-8. David Rohl (2010). The Lords Of Avaris. Random House. ISBN 978-1-4070-1092-2. Wikimedia Commons has media related to Avaris.